This extensive work grew out of Dr. Constable's personal study and his 45 years of experience as a pastor, professor and teacher. Twenty-five years in the making, this 2014 Biblesoft edition includes over 7,000 pages of material, and covers all 66 books of the Bible. 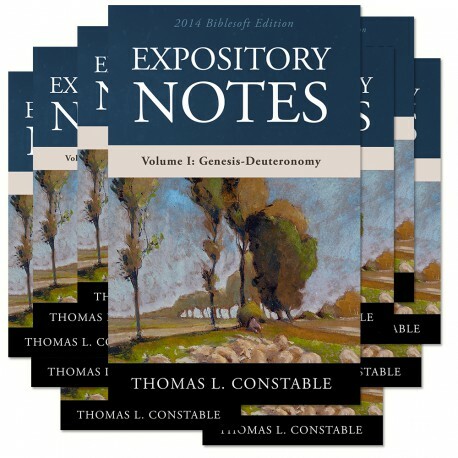 Biblesoft is pleased to offer this comprehensive set of Expository Notes by Dr. Thomas Constable, Senior Professor Emeritus of Bible Exposition at Dallas Theological Seminary. This extensive work grew out of Dr. Constable's personal study and his 45 years of experience as a pastor, professor and teacher. Twenty-five years in the making, this 2014 Biblesoft edition includes over 7,000 pages of material, and covers all 66 books of the Bible. Dr. Constable was the Department Chairman and Senior Professor of Bible Exposition at Dallas Theological Seminary in Dallas, Texas and resides today Senior Professor Emeritus of Bible Exposition, Dallas Theological Seminary. Dr. Thomas Constable graduated from Moody Bible Institute in 1960, Wheaton College, AB (1962), Dallas Theological Seminary, Th.M. (1966), Th.D. (1969) Dr. Constable is the founder of Dallas Seminary's Field Education department (1970) and the Center for Biblical Studies (1973), both of which he directed for many years. Today Dr. Constable maintains an active academic, pulpit supply, and conference-speaking ministry around the world. He has ministered in nearly three dozen countries and written exhaustive commentaries on every book of the Bible.